International Women’s Day is once again the focus for some female-led work, often with a passing reference to the anniversary for partial women’s suffrage. 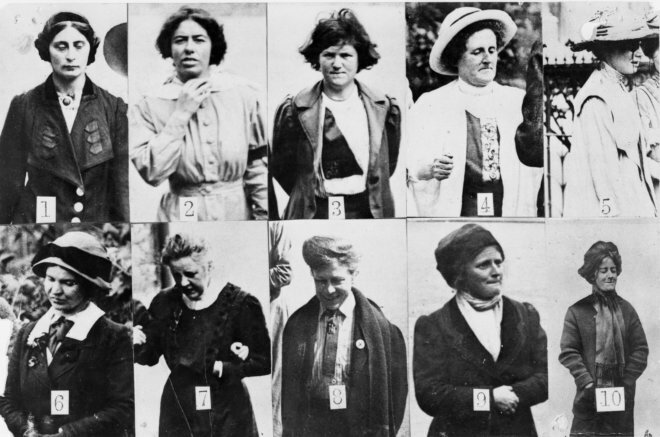 Suffragette City, a partnership between the National Trust and The National Archives, will re-create the life of a real Suffragette activist, Lillian Ball, a dressmaker and mother from Tooting, who was arrested for smashing a window in 1912. It runs from 8 March at WSPU Café in the London Pavilion. Stratford Circus Arts Centre have announced a week of performances to celebrate International Women’s Day on March 8. 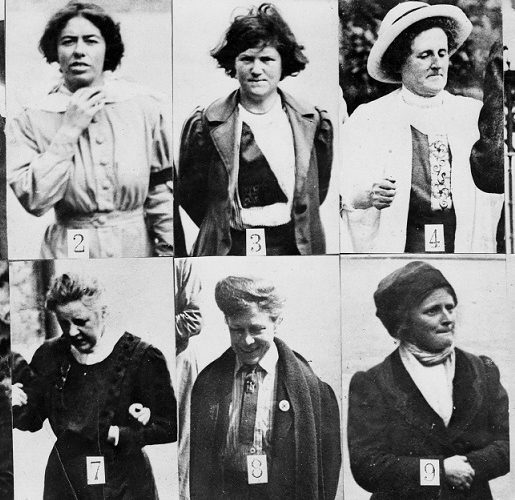 They explore the many fronts women continue to fight today for equality, 100 years on from the first women getting the vote. The shows include writer, performer and ex-boxer Libby Liburd with a new show unveiling the fascinating stories of female boxers, Fighter, poet and live artist Helen Seymour’s debut solo show To Helen Back which recounts her experiences of recovery from illness, cabaret star Fancy Chance globe-trotting and time-travelling in Flights of Fancy and Benin City’s Shanaz Dorsett will perform her first solo headline show and launch her debut EP Cake. Contact Young Company celebrates the 100 year anniversary of the Representation of the People Act (1918) with She Bangs the Drums. This show is based on research at the People’s History Museum and will take place in the Museum of Science and Industry’s characteristic 1830 Warehouse as part of the city’s Wonder Women 2018 radical feminist festival. It runs from 8 until 11 March. Once the festival is over at the Vaults, it’s going to be hosting the extraordinary-looking (and quite expensive) An Evening of Meat. A “unique dinner installation which destabilises our gaze and draws out our innermost contradictions as we become part of each performer’s journey.” An Evening of Meat runs from 27 March until 22 April. Proto-type Theater’s new show The Audit (or Iceland, a modern myth) looks at the human cost of the corporate and personal greed that consumes countries. It’s on tour from today in Lancaster before going to Salford, Stockton (BSL interpreted), London, Leeds, Lincoln, Oxford, Norwich and Ipswich. Alula Cyr’s debut production Hyena celebrates female strength with awe-inspiring acrobatics and synchronised displays of sisterhood. It’s on tour from 1 March to Bristol, Derby, Brighton, Folkestone, Newbury, Harlow, Goole, Barnsley, London (as part of Circusfest) and Malvern. You can find out more here. Sh!t Theatre will be in London for a month from 19 March before going on tour to Bristol, Canterbury, Norwich, Manchester, Colchester, Reading, Leeds, Portsmouth, Cambridge, Hove, Poole, Harlow and Plymouth. DollyWould is about country legend Dolly Parton, cloning, branding, immortality and death. There are a few interesting shows coming up at the Blue Elephant Theatre. Oneness is a contemporary physical theatre play about identity and mainstream culture in today’s world and how this affects the way women see themselves which plays on 16 March. The Glorious Tour is a female-led exposé of the heightened emotions surrounding motherhood, adolescence, growing up and letting go which runs from 21 until 24 March. At the Heart of Things from 19 until 22 April combines movement improvisation, visual imagery and devised text to create a contemporary adaptation of Oscar Wilde’s book De Profundis that dives into female sexuality, queer identity and homophobia. A little bit outside my usual remit but possibly of interest is The Other Art Fair which this year has women making up 51% of the participating artists including Morag Mysercough, May Parlar, Fei Alexeli, and Carolina Mizrahi. It runs from 22 until 25 March. And while we’re on the subject of art, on 26 March a sculpture will be unveiled in Southwark Park which is the outcome of More Creative: a creative arts programme from charity Create bringing adults with learning difficulties and primary school children together to design and make a new sculpture. South Londoners, give them your support! And lastly I’m horribly aware that this is very often too much of a London-focused blog, so it’s worth mentioning that Kathy Burke’s new production of Lady Windermere’s Fan will be broadcast to cinemas on Tuesday 20 March 2018. I recently really enjoyed Burke’s interview on Richard Herring’s podcast and I think her production will be worth a watch. Image one is from Suffragette City and is made up of surveillance photographs of suffragettes who had been imprisoned in Holloway. It is a series of blurry black and white photographs of women wearing Edwardian clothing. Crown Copyright, courtesy of The National Archives. Image two is a publicity image from Contact Young Company for She Bangs The Drums by Benji Reid. 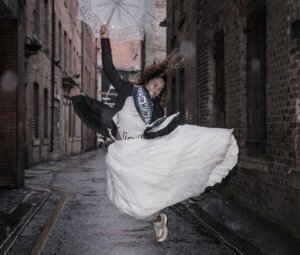 It shows a figure in a voluminous white skirt, suffragette sash and trainers leaping up in the air in a Manchester street. Image three is from DollyWould from Sh!t Theatre. It shows two performers wearing red sparkly dresses and with white-painted faces standing on stage holding cans of beer. Behind them is a screen showing the words “TOUCH YOUR WOMAN” and on the floor in front of them are two enormous fake breasts. Image four is a photograph by artist Carolina Mizrahi titled ‘Vanessa’. It shows a figure sitting down with their hands on their knees. They wear high heels, a dressing gown with feathers at the hems and wrists and a flower round their neck and look straight at the camera. The most striking thing about the image is the colours are very heightened; there is a strong blueish tone to the figure’s skin and to the image as a whole. It is very stylised.